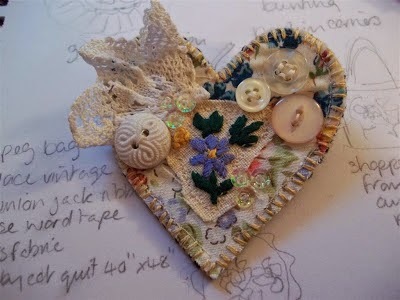 Homespun Stitchworks..... For the love of vintage: Making a vintage linen embroidered brooch. If you have some vintage linen it is a great base. Cut the shape you would like (square or maybe a heart and cut two pieces) and stitch a little design on there..... maybe basket of flowers or a garden of flowers with a little grass in between with long and short stitches. You could of course stitch on tiny vintage buttons in a pattern or even applique a design onto it. There is also the option to cut your chosen shape from a piece of already embroidered vintage linen as well and add some embellishment as well. Then all you have to to stitch both bits together right sides out and stitch round leaving a little opening so that you can stuff it and then hand stitch up the opening. You can bits of lace, buttons or anything you like at all. This is not one I stitched and do not know who did I am afraid but it shows you what can be done. Anyway give it a go and Happy Stitching!